Located on the east shore of Flathead Lake, The Marsh Family Cabins offers postcard views, spectacular sunsets and great swimming. Nestled in the trees at the end of a private lane, and just 8 miles north of Polson, off Highway 35, the three cabins rent as one unit making it ideal for several families to share. Available on a weekly basis, there are two full kitchens, 2 baths and enough beds to accommodate up to 12 people. The original log cabin built by our grandfather in the 1920s has been tastefully updated yet still retains its original charm complete with a large stone fireplace and screened in porch. A new deck extends from this cabin, almost over the water, and is a favorite for watching sunsets and lake activity. There are 3 double beds and 1 single bed in this cabin as well as a fully stocked kitchen and bathroom with shower. The 'little cabin,' built in 1942, has also been updated and now adjoins the 'new addition' which was built in 2000. The addition provides a second bathroom, kitchen and laundry room as well as a Victorian clawfoot bathtub. The addition has 1 double bed, and the adjoining cabin has 2 double size bunk beds in one room, a single in another room and a single cot in the living room area. This cabin has a gas fireplace insert for the occasional cool day. You'll have full lake access for swimming, boating, fishing and sunbathing from our dock. There is also a shore station for boats. 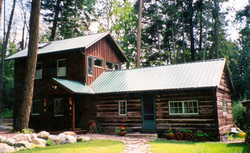 The Marsh Family Cabins is close to Bigfork, Glacier National Park, and the Bison Range. Missoula, Kalispell, Whitefish, and other recreational destinations are within two hours. Directions: The Marsh Family Cabins are located in Skidoo Bay on the east shore of Flathead Lake approximately eight miles north of Polson off Highway 35. .